There is a little distillery tucked into the shopping center at Drake & Lemay in Fort Collins. It's been here about a year. It's called Elevation 5003 Distillery and it's an upscale but fun and relaxed place to hang out for a unique drink at what is essentially a friendly, community-like table feel at the bar. It took me forever to go over there, even though it's within walking distance of my house. I didn't go simply because I've never been a hard liquor drinker, with the exception of margaritas, and it just wasn't high on my priority list, not being a drinking establishment frequenter. When my friend Melody told me I needed to go over there and she invited me to go with a group of runners, I checked it out. I began going there on occasion, trying to bring friends with me to convince them to check it out. Everyone was impressed each time, and one day I was sitting there with my running friend Crisann and the owner and manager were talking about having an Artist of the Month display on their wall. 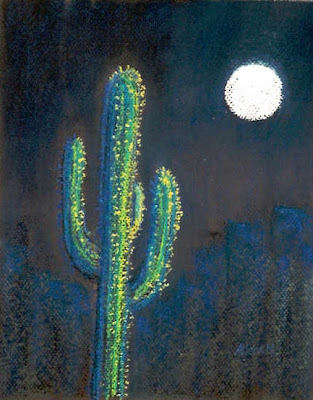 I asked about it and told them about my pastel paintings, and showed them some of my work. We set it up, and I am on for Artist of Month for March. I just got done putting everything together, since it's been a while since I've done a show or anything formal with my artwork. It was time consuming but fun, and it got me excited again. I've been having all sorts of ideas for painting. I happen to be in the middle of writing a book so I will have to wait a while before I can start working on those ideas but I will, hopefully as early as this summer. Their drinks are unique and they distill all their own hard liquor. My favorite by far has been Falernum. It's a combination of vanilla, lime, allspice, and other flavors. They call it "Christmas in a glass". It really is. I started making cocktails with it at home, and was having fun around Christmas. Come over to the Distillery in March, I'm going to be having receptions both Thursday evening March 2nd from 4 pm to 8 pm and on Sunday March 5th from 1 pm to 5 pm. All my work on display there will be for sale. This painting reminds me of winter. 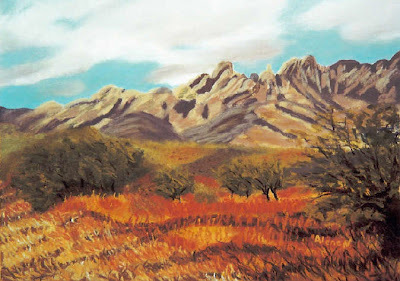 It is a winter scene in southern Arizona. "Winter at Madera" is one of my personal favorites. I've been away from painting for too long. I got caught up doing a million other things but nothing brings me back to peace like looking at scenic landscapes. Over the next year I have a major writing project I want to finish, I am writing a book, not about art, but about my other passion, which is health and wellness, especially for those who have been through the wringer of cancer treatment and trying to recover afterward. In 2017 I intend to be more active with my art, both in the community and in creating new paintings. I've been busy recently as we just adopted a new puppy and are getting another one in a few weeks! 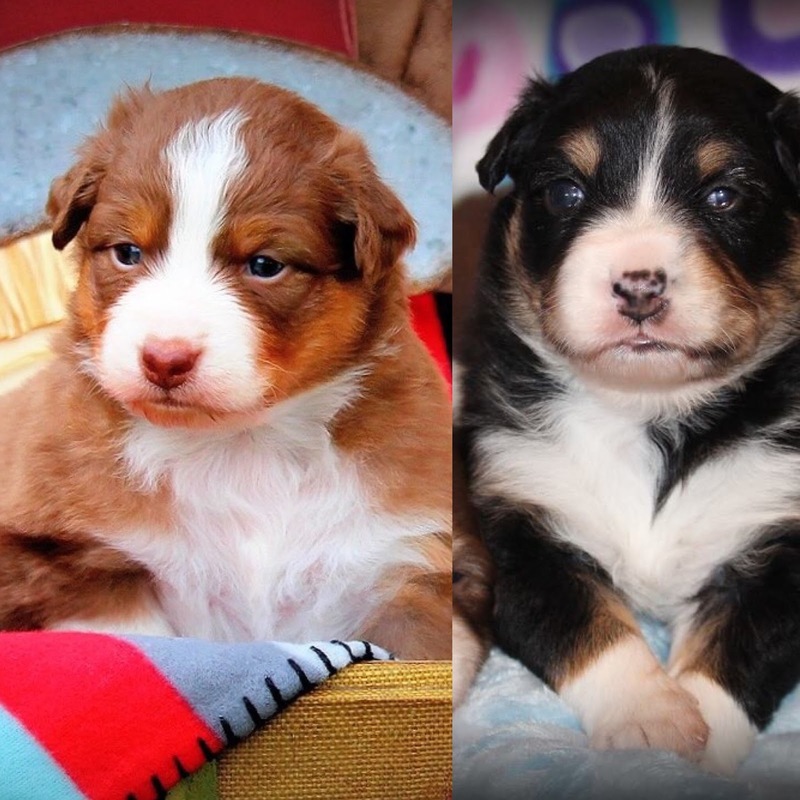 Velcro and Gypsy will be my companions as they become big, grown up Australian Shepherds. There's nothing like an Australian Shepherd puppy though. This is Velcro. She came to live with us three weeks ago. Her younger sister Gypsy will join us in mid-December. On the art scene, I am currently displaying my work at a local restaurant called Tortilla Marissa's and will be a featured artist one month this spring at a local distillery (TBA). I will fill you in on that after the holidays. Hope to see you back here soon! 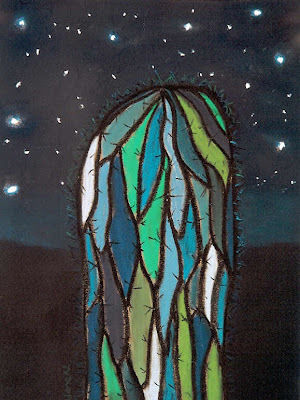 It's been forever since I've blogged here, just started playing with cactus the other day. 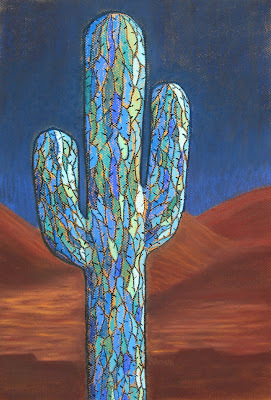 I have been playing with colors, mostly, because I found this great paper that lends itself perfectly to the desert landscapes I paint. It's below zero outside and I've been sick this week so there's not much to do except paint. The sky is clear and the snow is bright, which makes great conditions for painting indoors. 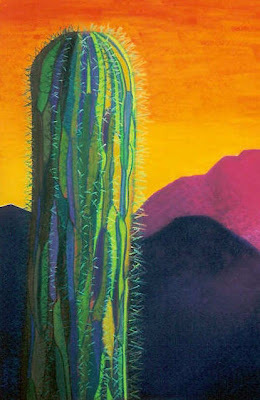 While I'm scribbling I've been busy in the background, recently hung about a dozen paintings at Main Street Grill in Windsor and will soon be placing some in Tortilla Marissa's in Fort Collins. It's been a while since my last post. I traveled to Arizona last weekend, to the Hopi Reservation, for a 50 km run, the Paatuwaqatsi Run. Very inspirational and spiritual. I have some painting ideas simmering now. 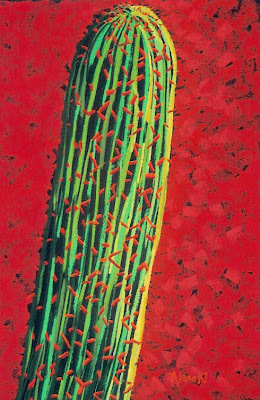 Red Spikes was featured in a blogpost at the re.collection art blog recently. I am headed down to Arizona again next week for a family visit. Now that the days are getting shorter and there is less daylight in the studio, I'll be working on the lighting. 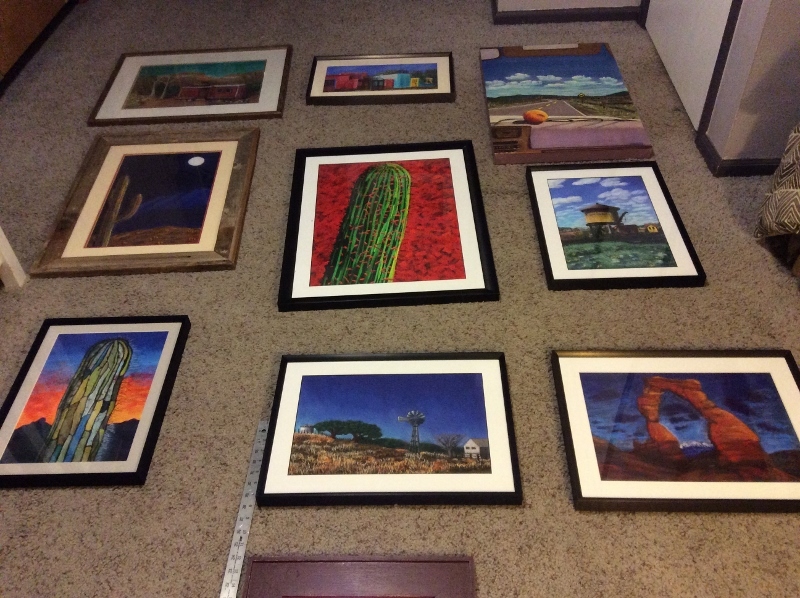 Recently took some of my new paintings to Fine Print Imaging in Fort Collins to get setups for giclee and prints. They do nice work! Highly recommend them! My Badwater paintings, Second Sunrise and On the First Part of the Journey, and Delicate (shown above) are now available on canvas or paper. Coming soon to my website: purchase online! Just playing with colors today. I'm supposed to be at work, but I sprained my ankle on an easy trail run yesterday and couldn't face being on it for 12 plus hours today. I hope to back on the trails soon. 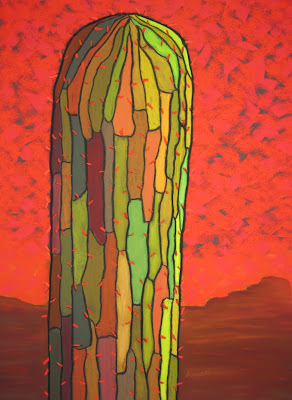 Five of my cactus images are now online in the gallery at re.collection art. Today I went to a frame shop and art supply store in north Fort Collins called Lloyd's. I haven't been there before but they were extremely nice and helpful, and their framing prices are reasonable, and they had a huge selection of frames for such a small shop. I bought some velour paper today and I'll be going back. It's hard when you move to a new place, figuring out where to get things and who to go to. I have a long stretch of days off coming up and I am getting ready to ultra paint. 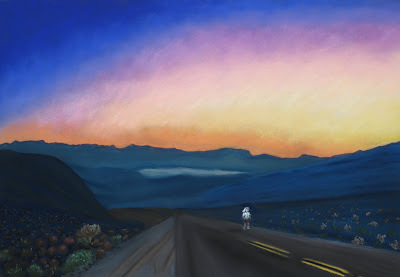 "Second Sunrise" depicts a lone runner starting the ascent out of Panamint Valley on the second morning of the race. The Panamint dry lake beds are illuminated in the background, climbing to the top of Father Crowley lookout. "On The First Part Of The Journey"
"On The First Part of the Journey" is an image of a runner dwarfed by the colorful rocks of early morning of the long, hot first day of the Badwater race. 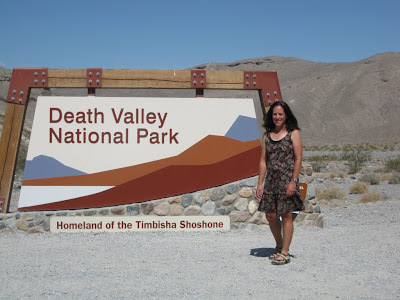 I spent last week in Death Valley for the Badwater race, then afterwards I went back to see some places I don't have time to visit when I'm out there for the race. 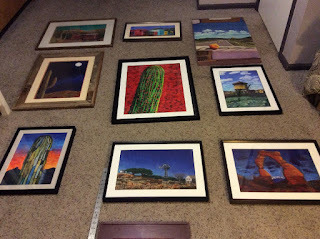 I have about two dozen ideas for paintings! Now I have to find the time to do it! I'm calling this one "On the first part of the journey", if you can remember the words to the 1970s America song "A Horse With No Name" which is fitting for running Badwater. It's a new take on an old sketch I did back in 2002. 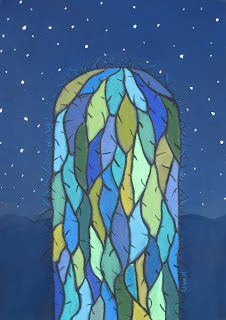 I want to revamp some other paintings I did back then, but I have so many new ideas! My Badwater project will likely last several months. That's okay. I can't think of a better place to be all summer! July is the perfect time for a road trip to the desert. Next week I'm going out to Death Valley to work as a medical volunteer at the Badwater Ultramarathon. I can't wait to get out there again. I'm flying to Las Vegas, but after that it will be road tripping. It's been hot, in the 120s. It could be 130 degrees. I love the blast of heat, rolling the windows down, no A/C, like driving through an oven. I look forward to taking some time after the race, on my way back, to take pictures and check out some of the scenery that I've never had a chance to look at closely. All the times I've been out there in the past I've been either training, racing, or crewing. 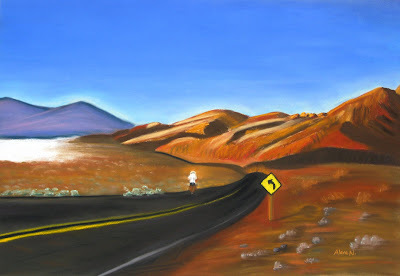 Badwater, Panamint Dunes, Devil's Cornfield, Devil's Golf Course, Artist's Drive, and many other places along the race course will be great subjects for painting. Some days are better than others. 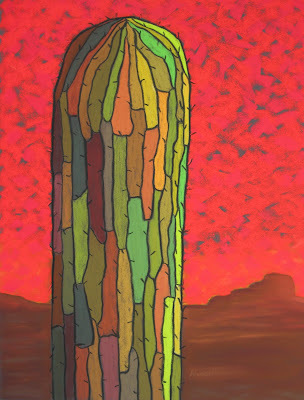 When you end up with something like this, you have to laugh at it, get it off the easel, and move on. The Mohawk needs some work. 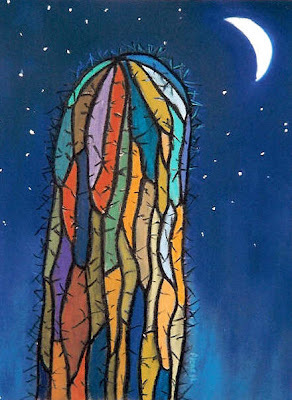 Cactus with a Mohawk has proven to be a favorite, and I sold the original several years ago. 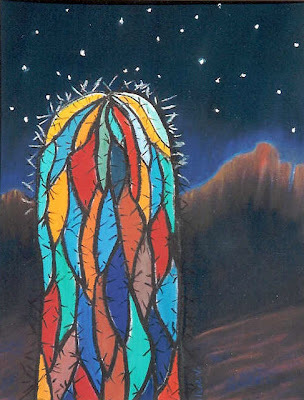 I am working on another cactus with a mohawk, and no two paintings are alike, but this one has the potential to be just as popular as the original mohawk. I'm still working on a few details but it's getting close. Running out of fixative mid-painting was a challenge today. 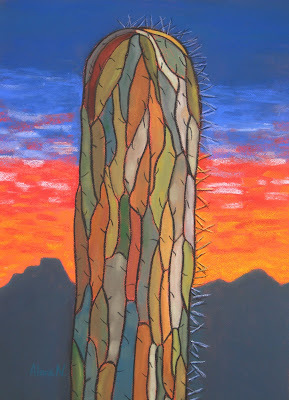 Today I finished Cactus! and framed it. It's in a black frame and looks nice. I also finished a piece on velour paper (messy!) 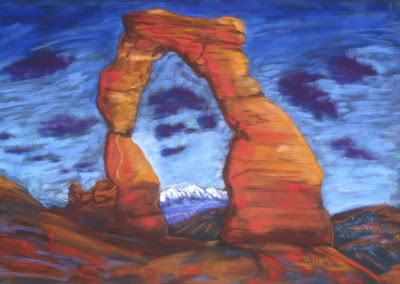 called Delicate and it's a painting of Delicate Arch in Utah. 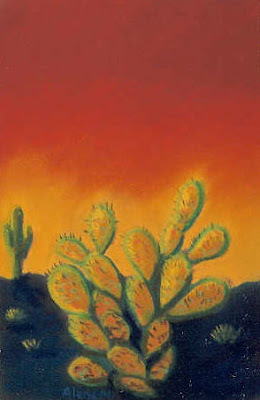 Today I registered the domain name alenepastels.com. Now I'm on my way to building a real website. Progress in small steps. I did make progress on designing a business card and a few other things. No painting this week, too busy at work and getting things in order around the house. We've had a rash of things breaking or not working lately, I'm trying to get everything back in working condition or spending time on the phone with technical support in various parts of the globe, which is never a quick process. I plan to work my way through the website design and setup over the summer. That will give me time to paint. 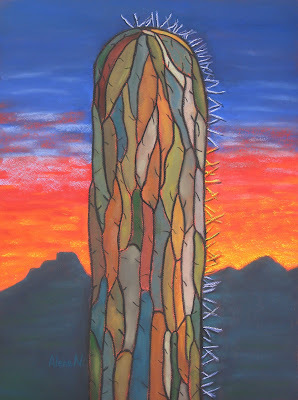 Today I felt like doing a Cactus! With the exclamation point... 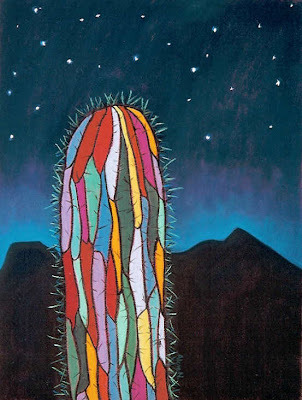 I want someone to walk into the room and the first thing they notice is CACTUS! Needs some stars, or a moon, or something. Not sure yet. 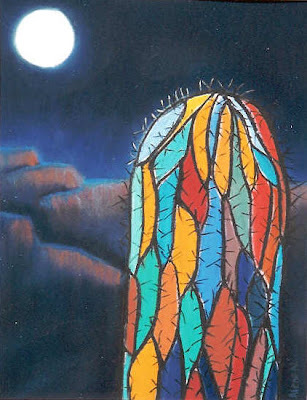 Here are some of my cactus series. Most are older, especially the last few shown, and back then the photo quality was poor, so they don't show up clearly on the blog. 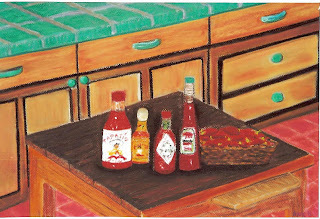 These are some of my older paintings. Some of the photographs are poor quality and don't show up clearly here. But this is what my early work looked like. We have a new artist coming soon! 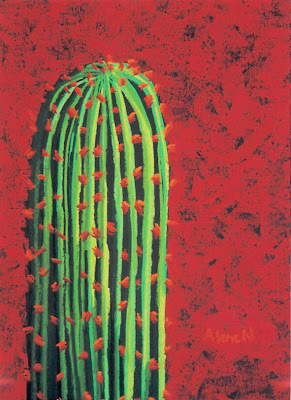 Alene Nitzky is a fantastic local artist and we are excited to host her work for the month of March! Mark your calendars for March 2nd and March 5th for a soft art showing! 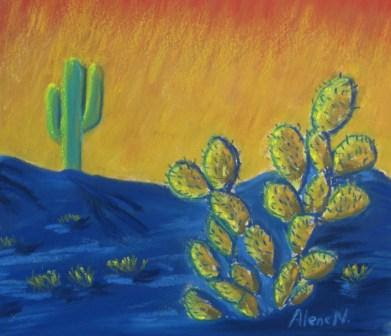 Alene paints southwestern-inspired landscapes in pastel. Her formal art training began after her academic training in forestry and earning a doctorate in natural resources recreation. 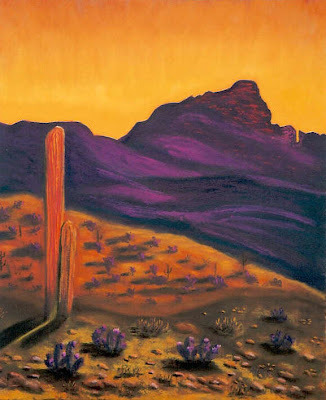 She started painting in acrylics and mixed media, then discovered pastels as her favorite medium, studying under pastelist Alene Rucker of Mesa, Arizona. 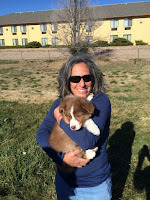 She now lives in Fort Collins, Colorado, where she works from her home studio. 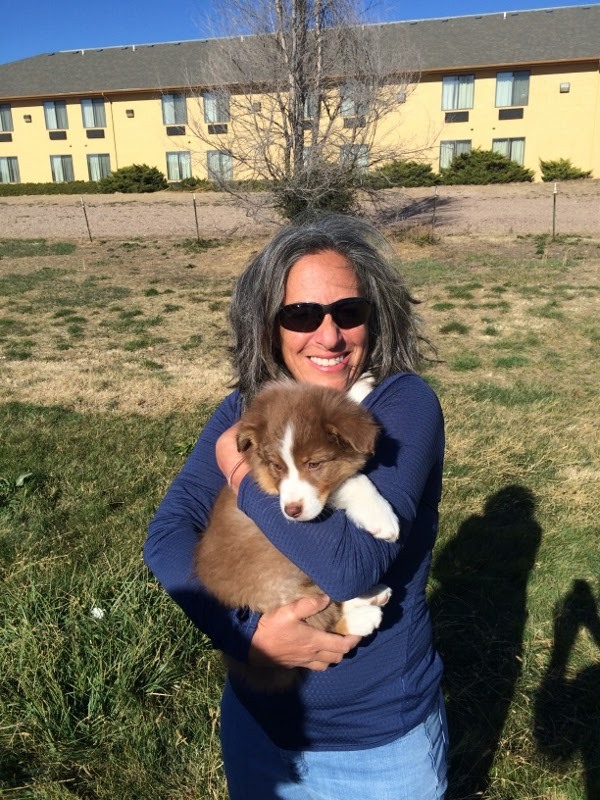 As an outdoors enthusiast and longtime ultraendurance runner, she loves to run in the desert and mountains. 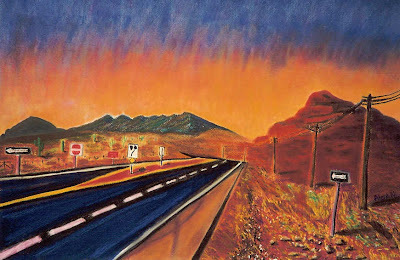 Her paintings are inspired by the sights, sounds, and energy of the landscape in the colorful and rugged places through which she runs. 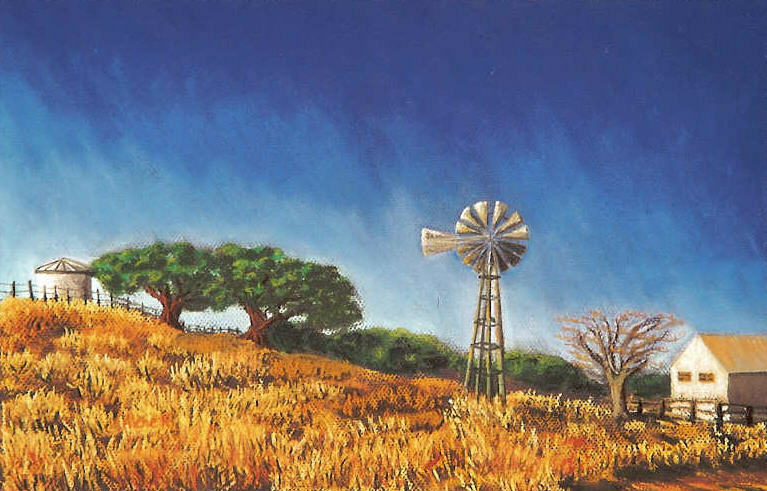 Alene observes the subtle and dramatic changes in light and shadows throughout the days and seasons, and re-creates these in her paintings. 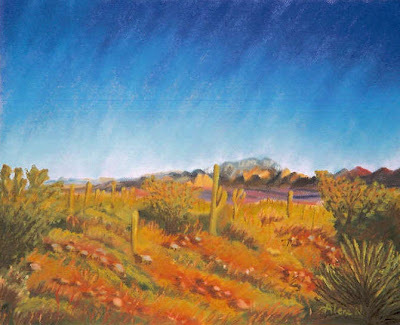 She accentuates the effects of wind, sun, weather, and time, and emphasizes motion in the skies, using rich textures of paper and bold colors of pastels to draw the viewer into the scene and share the feelings of being there. 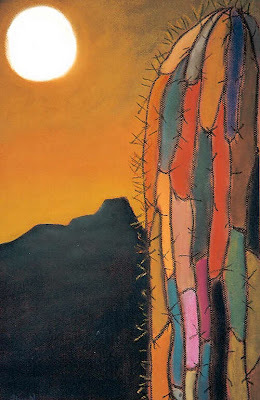 Her work has been described as "imaginative and inspiring" and "a sense of wonder in vibrant color". Alene says of her work, "When I'm running, I go way back on trails into places that most people never see. I see old buildings and structures remaining from the past, they remind me of how we used to live in a simpler time. 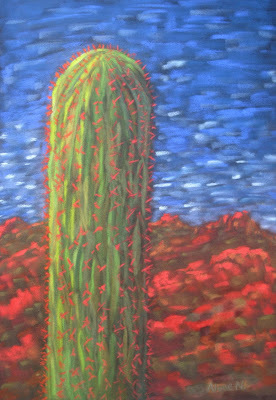 The elements of the desert and mountain landscapes inspire me, clouds moving across the sky, colors in the rocks, energy in the trees and plant life, I try to capture all of this in my paintings."